The ride is designed for every rider to have a solo vehicle (although sometimes two kids squeeze into one). Loading and unloading takes place in a neat cluster of two rows of saucers. Sit down on your individual Space Age pod. Hold on to the round handles on either side of your seat. Tilt your body to make your saucer scoot across the ride surface. Wherever you go, your saucer actuates air valves as you pass over them. All the lift comes from below. Your saucer has no moving parts—or, more accurately, you’re the only moving part of your vehicle. You can go remarkably fast. Bump into other guests—surprise them from behind! This ride has been called “the bumper cars of the future,” but that’s not entirely apt. Earthbound bumper cars collide with a jarring thump. But these airborne bumping saucers bounce off each other delightfully when they collide. It’s a different sensation. If you sit straight up, you’re likely to find yourself bouncing up and down. So lean in any direction. Scooting and colliding are more fun than bouncing. When your ride cycle ends, the giant arm pushes you back into the loading area, releasing the other fleet of saucers in your half of the oval onto the same ride surface. Walt Disney sent aloft 32 flying saucers Monday morning. 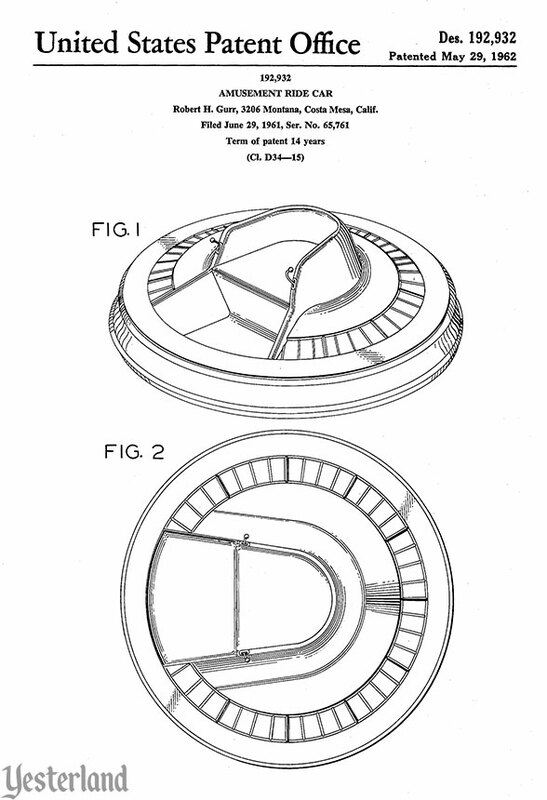 It figured Disney would eventually get around to constructing a saucer springboard. Disney’s saucer launch pad is the latest attraction at Disneyland. Those aboard the first flights included a man-size Pluto the Pup, a space girl, a space man and two jet pilots from El Toro Marine Base, Lt. Col. J. P. Willcox and Maj. Walt Jacobs. 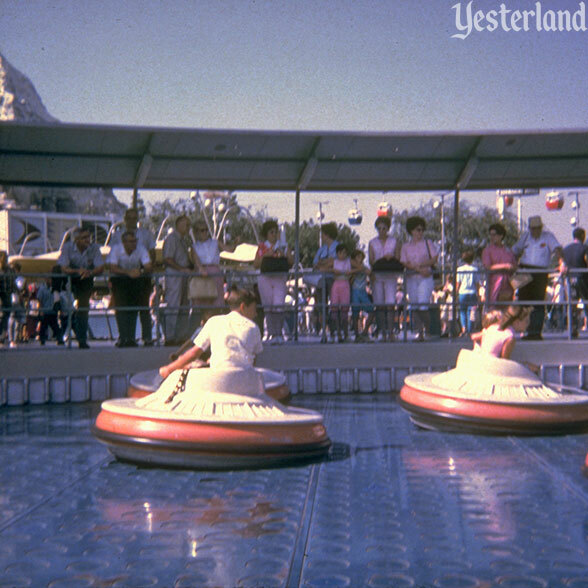 The Flying Saucer ride cost $400,000 to build, Each saucer is “blown” 8 in. off the ground and is under constant control of its pilot. It’s unclear how the Times reporter multiplied 16 by 4 and came up with 32 saucers. Perhaps only half the ride was open. The article also did not note that each “pilot” was a park guest. Flying Saucers used patented technology, developed just for this ride. 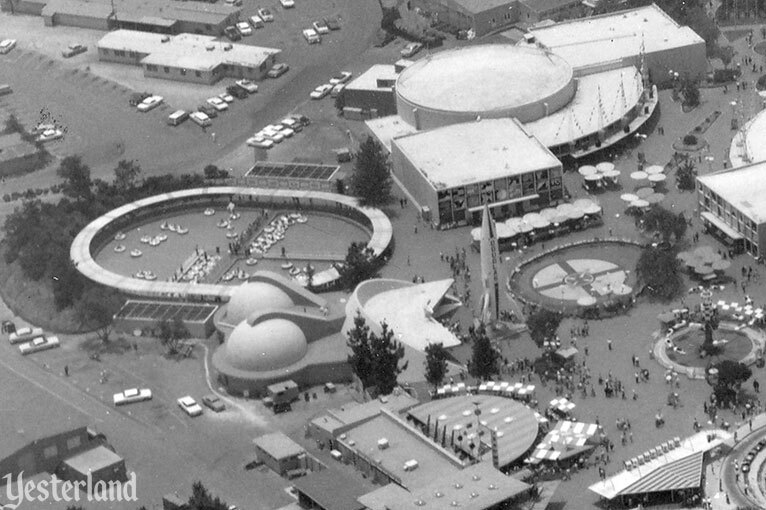 The innovative infrastructure was by Arrow Development of Mountain View, California, while the little saucers were the creative work of Bob Gurr—a rare Gurr design with no moving parts. 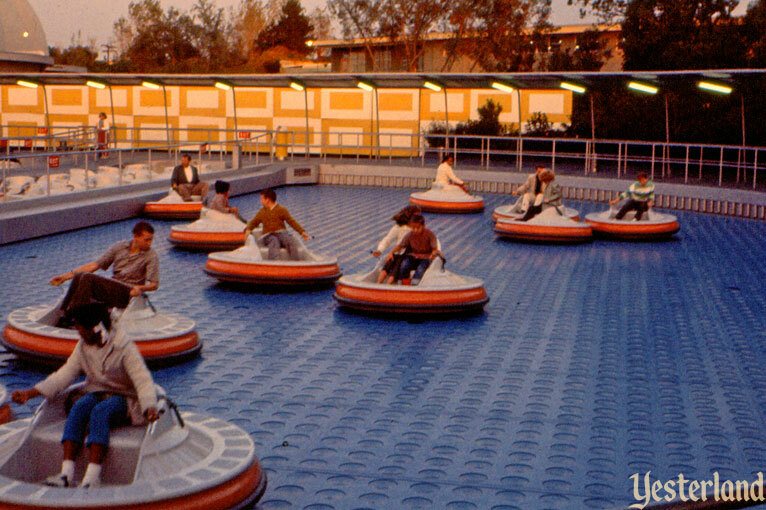 Flying Saucers closed on September 5, 1966—along with much of the rest of Tomorrowland. 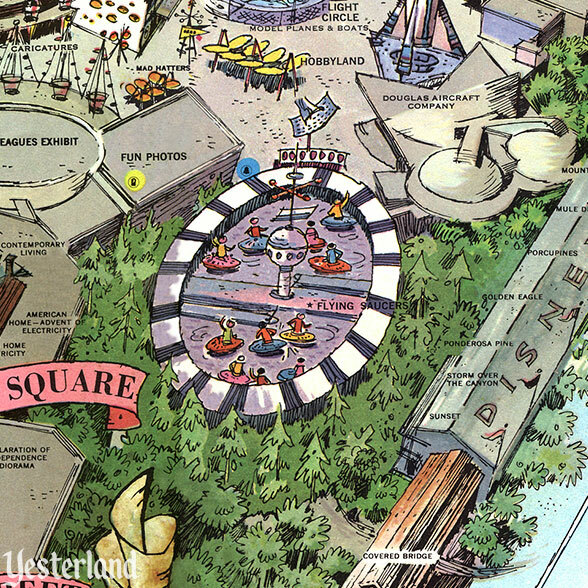 When Disneyland’s New Tomorrowland opened July 2, 1967, guests found an amazing array of new attractions, including Monsanto’s Adventure Thru Inner Space, the Goodyear PeopleMover, the General Electric Carousel of Progress, Rocket Jets, America the Beautiful in Circle-Vision 360 presented by the Bell System, and Flight to the Moon presented by McDonnell Douglas. But the beloved Flying Saucers ride was nowhere to be seen. In its place, the Tomorrowland Stage offered concerts and shows. Perhaps the absence of Flying Saucers would be temporary. After all, new Disneyland Souvenir Maps showed something called Space Mountain. Would Flying Saucers be on the bottom level of that Space Age marvel? It didn’t happen. 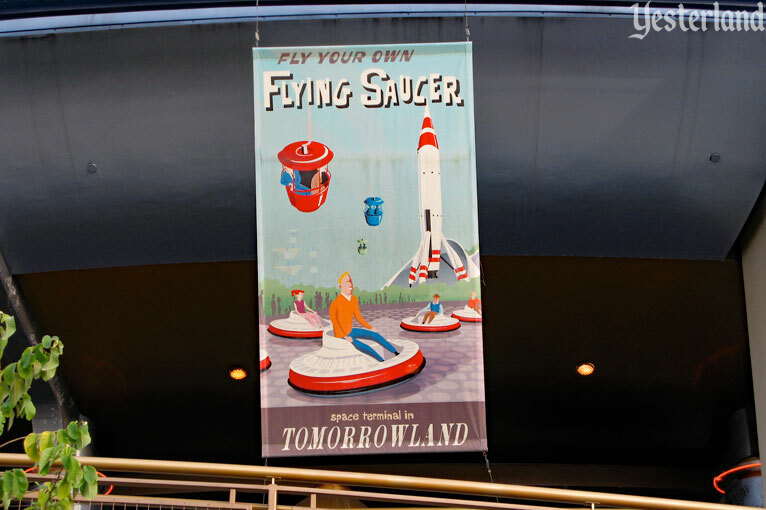 Flying Saucers had a run of just over five years, and then never returned to Disneyland or anywhere else. But wait! Wasn’t Luigi’s Flying Tires (2012 &dash; 2015) supposed to be the return of Flying Saucers—only now with great storytelling, plus 21st Century technology to overcome the original operating headaches? Luigi’s Flying Tires had clunky multi-rider vehicles, which were difficult to maneuver, slow, and not particularly fun. 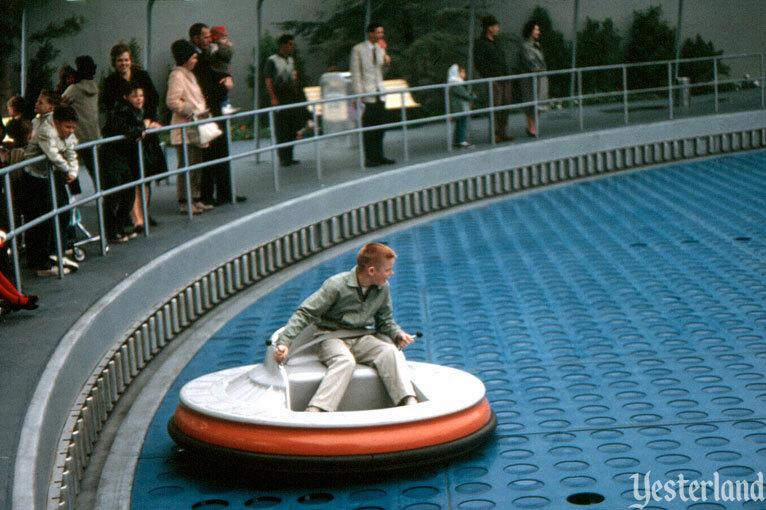 The single large ride surface made it a slow-loading, low-capacity attraction. The wonderful indoor queue was the best part. 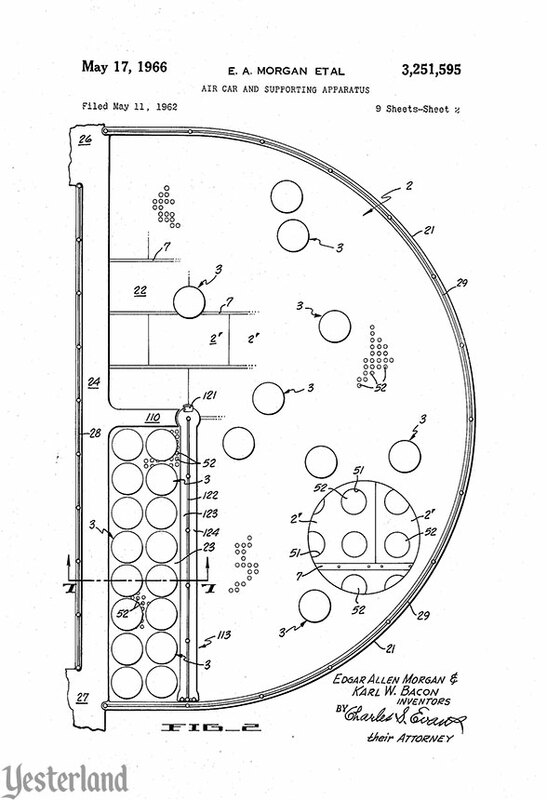 Maybe, some day, Disney can dust off the old patents and blueprints to bring back Flying Saucers properly—just like the 1961 original, only with computerized process controls to keep the air pressure perfect and the ride operating reliably.